A landing page is a web page created for the specific purpose of informing a user of a service, business or product. Landing pages usually have some sort of form on them that captures user's information, generally this includes email address, first name and last name. Any user that submits information into your form will turn into a "Lead". The more attractive and better designed your landing page is the more likely someone will be to submit information on your landing page's form. 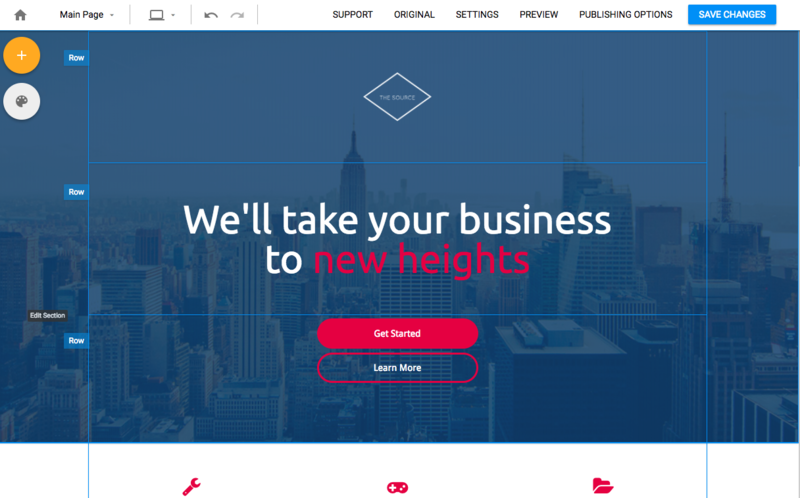 Wishpond offers a variety of templates to choose from when creating your landing page. Choosing a template depends on the design you want for your landing page, if you already have a set design in mind you can start from scratch by choosing a blank template and give it its own personality. After choosing your template you will be able to edit it specific to your company. For now we will go over the basic components of a landing page so you can learn everything need to get started. Right away you will be able to see that you have sections on the page. Sections allow you to insert content using our tool bar. When you first insert a section, the section will contain 1 "Row" and 2 "Columns". You can always add more sections and even rows and columns within sections. Using them properly can help your landing page's design and improve its conversion rate. Using them will also improve the page's mobile responsiveness as it will adjust based on the sections, rows and columns on the page. The Wishpond landing page editor is sorted through rows, there are 4 types of rows you can insert into a section. They vary from rows containing 1-4 columns, however you can insert more columns by dragging and dropping it into the row. You can also edit the setting of your rows and columns, by clicking on the columns edges you can change their widths with our snap grid. Although selecting between rows and columns can be a bit of a hassle it is easiest to look for the tab on the edge of the object that you want to select, look for the name of the object you are trying to select and this way you will have an easier time editing your landing page. Landing pages are a great way to encourage conversions and start capturing new leads into your sales funnel. Hopefully you now have a better understanding of what they are so you can get started on yours.